Dear Dr. Epstein, It was a pleasure to have met you this past Monday during your AAAASF re-accredition survey. You are to be commended in providing such quality care to your patients, and assembling such an impressive and friendly staff. Erin was a wonderful help and a real delight to be with. My very best wishes to you, your wife and family, and your proactive/avocations. Again, congratulations on a job well done. Dr. Epstein, I wanted to send you a thank you for everything that you and your staff has done for me over the last few months of surgery. As you are aware, 80% of the reasoning I needed to come was to have corrected what another surgeon did not correctly fix. You have gone above and beyond what my expectations were. Not only did you take what the other doctor did and correct it, but you made my scars look better and made my body look 100000% better. I cannot even describe in words what that means to me. The work you do is remarkable and the care you have for your patients shows by you showing up on time and putting your wizard skills to work and giving people what they could never have. You are an amazing surgeon and I am so glad that Laine referred me to you. I could not be happier with all you have given to me…. Elyse, thanks for all your advice and help on management after procedure. It really helped to hear all you had to say during this time. Knowing how someone else got through it helps! Dear Dr. Epstein, Thank you for being one of the good guys. You didn’t have to see Mark and care for him at 9:30pm but you did because you are still a doctor that puts people first. We are grateful for your kindness. Dear Dr. Epstein, I can’t tell you how thrilled I am with my facelift and liposuction. During the initial consultation you had me lay on the table and hold a mirror above me. “That’s how you’ll look” you said, and you delivered! Thank you so much! I couldn’t be more pleased! Dear Dr. Michael A. Epstein, Thank you so much for making my surgery a comfortable experience. I’m healing very well and appreciate you and your staff for reaching out to my needs and keeping me in safe hands. Not only are you a great surgeon, but you have a good positive spirit. Again, thank you so much for the wonderful job you’ve done! The outcome couldn’t have come out any better! I am very happy! Thank you again. Dr. Epstiein, Wendy, and staff – I would like to take the moment and thank you all from the bottom of my heart for all you have done for me! I could never imagine that this procedure could be “no big deal!” I have been to several surgeons and yet not one of them had your positive attitude, knowledge, and great personality that truly has made my experience enjoyable! You have also showed how much care you put in each of your patients! All of you have always been able to answer any of mine and my husband’s questions, which we are both very thankful for as well! Dr. Epstein, you have given me the confidence I was missing before, and for that I could never be thankful enough! Thank you again! Dr. Epstein, Wendy, + staff – I know that I haven’t even had surgery but I wanted to say thank you for making my consultation such an informative and pleasant experience. I was SO nervous but everybody’s kindness made me feel so comfortable. I am so excited to get my implants! May 10 can’t come soon enough! Thank you for everything! Dear Dr. Epstein and staff, I want to thank you all so much for guiding me through my operation. Being that this was my first surgery, I had so many questions and was so scared. You all made me feel so comfortable from day one and really took the time to make sure everything was ok. There are not many doctors today who provide the service you did and I appreciate it so much. You are all so wonderful! You made me get over my fear and I never thought that was possible. A special thanks to Wendy and Amanda, I would have been lost with out you. Dear Dr. Epstein – I cannot express how pleased I am with my tummy tuck results. My “before and after” pictures are unreal! I just wanted to thank you and your staff for the great experience! I know you’ve heard it a million times but you are a wonderful and talented doctor. Thank you, I’m happier and I’m leading a healthier lifestyle. 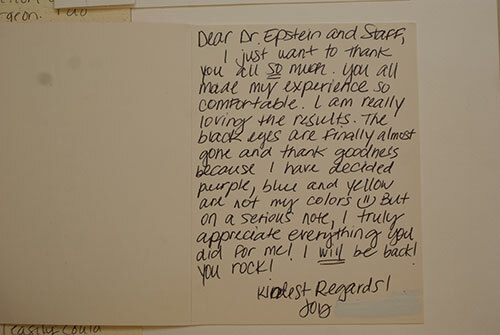 Dear Dr. Epstein – I just wanted to thank you and your staff for always being so patient and kind. I have had a lot of work done these past couple of years, and every time I have always been treated so well. Before, during, and especially after surgery. I waited many years to finally have these procedures done. Your staff made me feel comfortable and safe, which is the main reason I chose your practice. I have been really happy with my results and never had any complications. 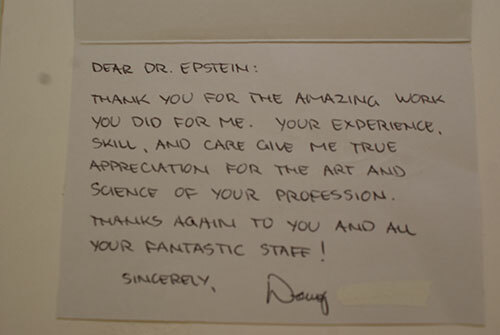 Dr. Epstein – Thank you so much for ding such a wonderful job with my surgery. I had heard wonderful things about you and your staff before coming in and you managed to exceed those expectations! Your dedication and care for patients and the community does not go unnoticed. You have forever changed my life and I am very grateful to have met you. Thank you so much, I wish you the best in the future. Dear Dr. Epstein – As the anniversary of my surgery past in December, I just really wanted to say from the bottom of my heart how amazing you and your staff are. Thank you for changing my life in a way that no one could ever do. Not a day goes by where I don’t stop to think about how blessed I am. You are my hero. Dear Dr. Epstein, Jill, Erin, and all the staff – Thank you so very much for everything you have done for me! Words cannot begin to describe my appreciation and gratitude, for such a beautiful experience and gift. You all are true professionals, you’ve changed my life, enriched my life, have done more than you will ever know. Thank from the bottom of my heart! 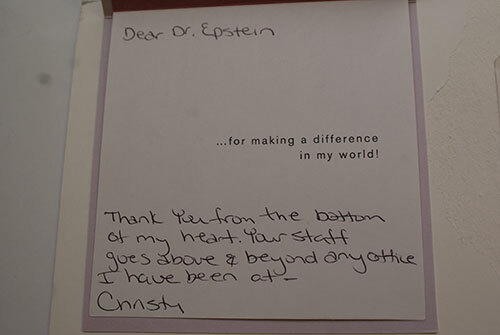 Dear Dr. Epstein, Thank you from the bottom of my heart. Your staff goes above and beyond any office I have been at. Dear Dr. Epstein, Thank you for the amazing work you did for me. Your experience, skill, and care, gives me true appreciation for the art and science of your profession. Thanks again to you and all your fantastic staff! Dear Dr. Epstein, I know you get a million of these letters each year, but I figured one more couldn’t hurt. I just wanted to let you know how much you changed my life. I came in as a 16 yr. old girl with her mom, both of us crying because we were scared and we both knew you were my only hope. When I first met you, I remember feeling like a monster. I could not lift up my shirt without crying because I was afraid you would laugh at me. You promised me that day that you would take care of me and everything would be fine. And in the four years you never let me down once. Now I sit here as a 22 yr. old women more confident in myself than I ever thought possible. I walk with my head up high and I know that could have never have happened if I was not blessed with you in my life. Even though I have scars, I do not look at them as anything else than beauty marks. There are not enough words or actions in this world to pay you back for what you have done for me. You will always be in my heart and everyone who comes into my life will know about you and how wonderful you are. I thank you (and my mom would too) for giving me a chance at such a young age and giving me a new look at life. I will always be grateful for your gift. 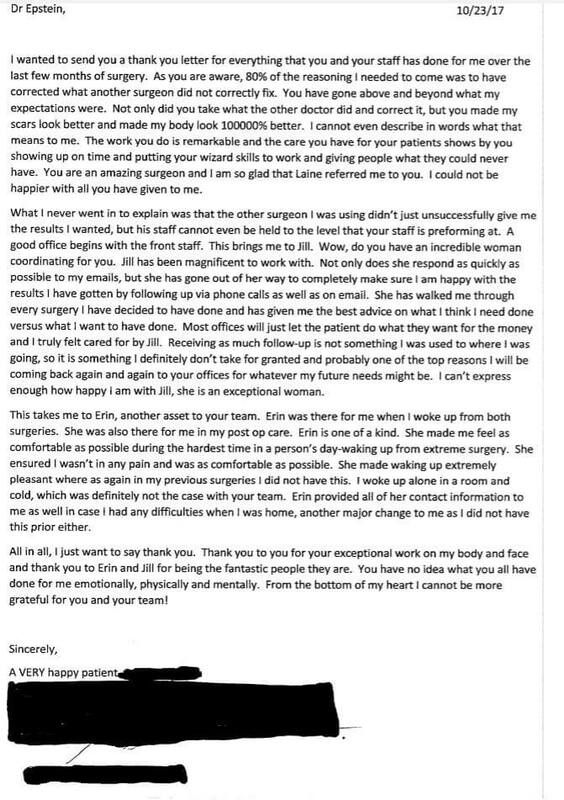 Dear Dr. Epstein, Thank you for making sure my surgeries and recoveries have gone smoothly. I feel great. Dear Dr. Epstein, I just want to thank you all so much. You all made my experience so comfortable. I am really loving the results. The black eyes are finally almost gone and thank goodness because I have decided purple, blue and yellow are not my colors. But, on a serious note, I truly appreciate everything you did for me! I will be back! You rock! Dear Dr. Epstein, Thank you so much for my amazing new face! Your incredible skill really changed my life! Wishing you a Happy Hanukah and a happy healthy New Year. Enjoy! Dear Dr. Epstein, I cannot express my gratitude enough. You went above and beyond all of my expectations – it is just as important to acknowledge great work as often as people make complaints about poor service. Thank you for the great work! Thank you for all you have done for me – as well as the great care and service the entire office has provided to me since the day I stepped into your facility. It means quite a lot when a doctor and staff not only care about the patients results, but the patient’s experience and the patient! Thankful. Appreciative. Grateful. Our board certified plastic surgeons, Dr. Epstein and Dr. Krochmal, perform plastic surgery for patients all over Chicago and the surrounding areas. Our office is only 8 miles east of Wheeling and 12 miles north of Evanston IL, so you can easily set up a plastic surgery consultation at your convenience. Call us today for scheduling. Welcome to MAE Plastic Surgery, located in Northbrook and serving the Chicago metro area, where it’s all about YOU and your positive aesthetic experience. No matter what type of procedure you are seeking – breast augmentation, tummy tuck or any of the other type of procedures we offer, we will make your experience as stress free and positive as possible. © Copyright 2019 MAE Plastic Surgery. All rights reserved.